Recently I was at Whole Foods with my wife and she was gazing at the baked goods section right next to the coffee shop wishing she could order one of the brownie type bars they had…. After our Dairy Free/Gluten Free adventure started a few years ago she really misses baked goods. So thought for a moment that I could make a delicious bar that just might do the trick. So I headed for the produce aisle to try and find some Medjool Dates and then to the raw food aisle for Cocao Nibs before we left. 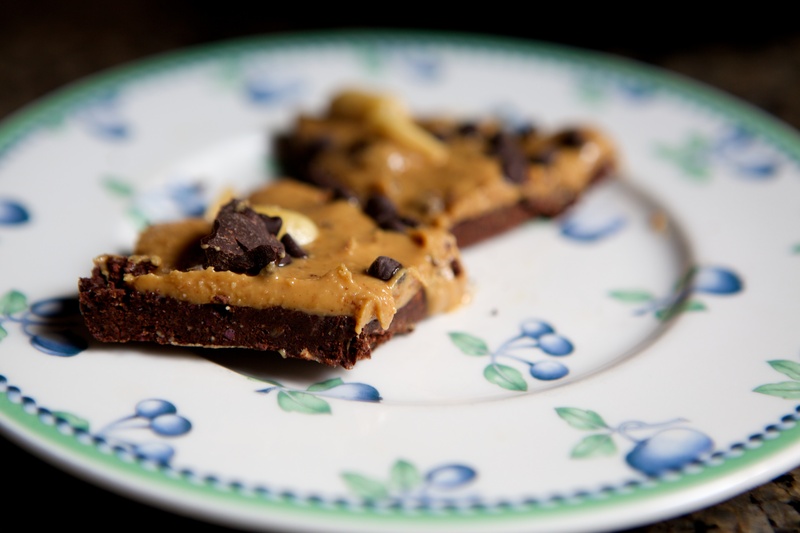 Spread out in a dish and cover with Organic Peanut Butter, peanuts and chocolate chips! Now I have to admit that I just guessed on the amount of ingredients I’ll have to remake it to adjust accordingly, but I feel it’s a fairly accurate guesstimate. They are delicious! Refined Sugar Free, Dairy Free, and Gluten Free… I’m going to try them with Almond Butter too!